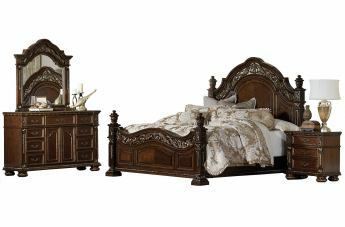 Old-World European styling is captured in the dramatically elegant Catalonia Collection. 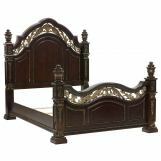 Traditional design elements reign at every turn – egg and dart molding, acanthus leaf carving, bead molding, gold tipping and extravagant carvings – creating a sophisticated look for your bedroom. 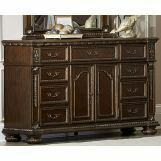 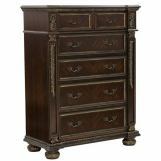 Each drawer front features antiqued brass fixed-drop hardware with decorative flourish that furthers the elegant appointments that embellish this collection. 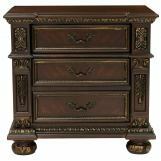 A traditional cherry finish is utilized to highlight the cherry veneer of the set and decorative inlay patterns found on the case good tops. 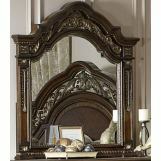 Metal scrollwork provides additional visual interest to the headboard, footboard and mirror framing.